Hi all! Hope everyone's day has been fantastic. Mine was good, but ultra busy. So busy, that I woke up extra early this morning to get some good pictures of my nails in the sunlight before the day took it's toil on them and tipwear showed up -- only to have my camera's battery die on me! I did manage to get some pictures inside, and ended up with a not-too-shabby outdoors iPhone pic, which sure is a relief-- I would hate to not be able to share this mani! 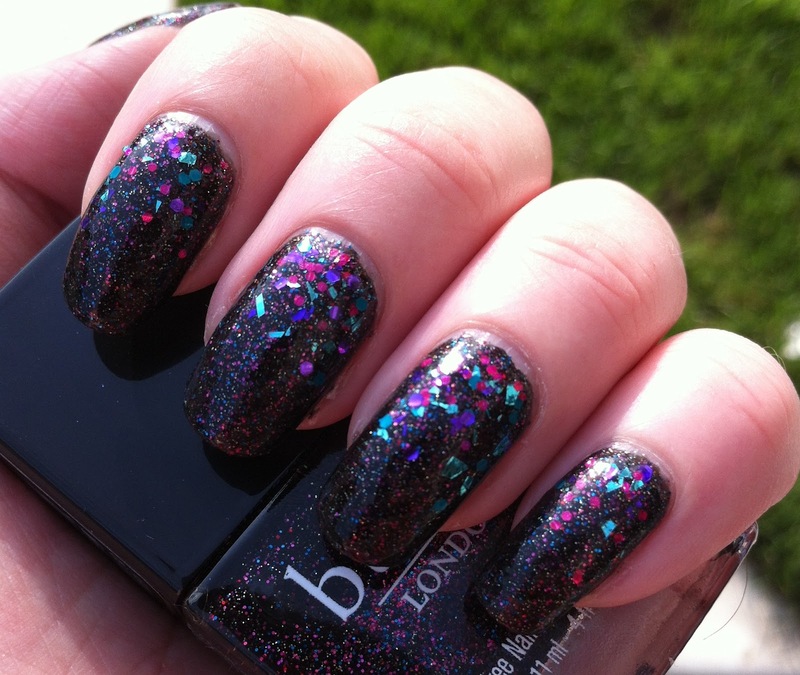 Today I have for you butter LONDON The Black Knight. I am sure most of us know of this amazing polish by now, which is chock full of black, pink, blue and silver microglitter. In one word, it is amazing! I'm a sucker for dark polishes with a little something special added in like colorful microglitter, so this one hits the spot. I wore three coats here, but easily got away with two thicker coats on my thumbs. As if it wasn't sparkly and fantastic enough already, I decided to add a chunky glitter gradient over The Black Knight. Looking through my stash of untried indie glitters, I found a winner in Hit Polish Razzle Dazzle, which has the exact perfect combination of glitters to go with The Black Knight! Razzle Dazzle is full of lovely pink, aqua, turquoise, and purple glitters in both hexes and shards. It was perfectly thick, also -- I had to dab to get it on only half my nail, but I have a feeling it would apply perfectly if you were doing the whole nail. Check it out below! Hope you love this combo as much as I do! If you are curious, you can buy Hit Polish here at their Etsy shop. Do check them out -- they have a wide variety of great glitters! Absolutely love how this combo worked out! Also really loving just adding the chunky glitter to the top half. Black Knight is so pretty!